When I'm developing "My DocumentDB" I decided to enhance the JSON input part by introducing a designer. 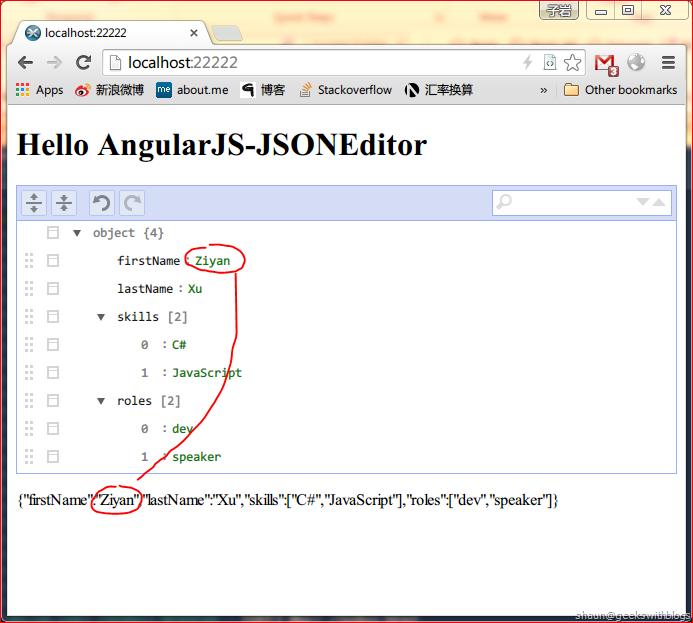 After Google-ed I found JSONEditor is good to me. 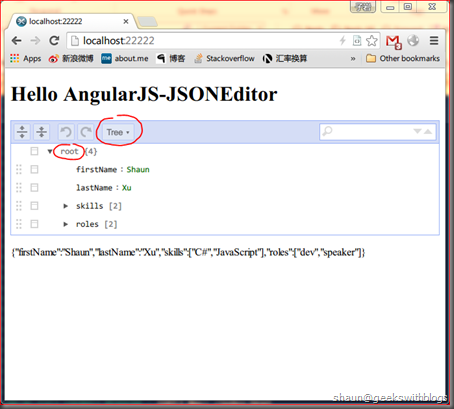 It's a web-based tool allows to view, edit and format JSON with simple API to integrate into a web page. Then I was going to use this cool thing into my project. I firstly created a directive that will apply JSONEditor in its DOM. The JSON data will be specified from the "ng-model" attribute. The code is very simple as below. One thing need to be paid attention. I specified JSONEditor "change" event function so that it will update the JSON value back to the scope variant. Since this event triggered outside of AngularJS event-loop I need to wrap the update code into "scope.$apply". 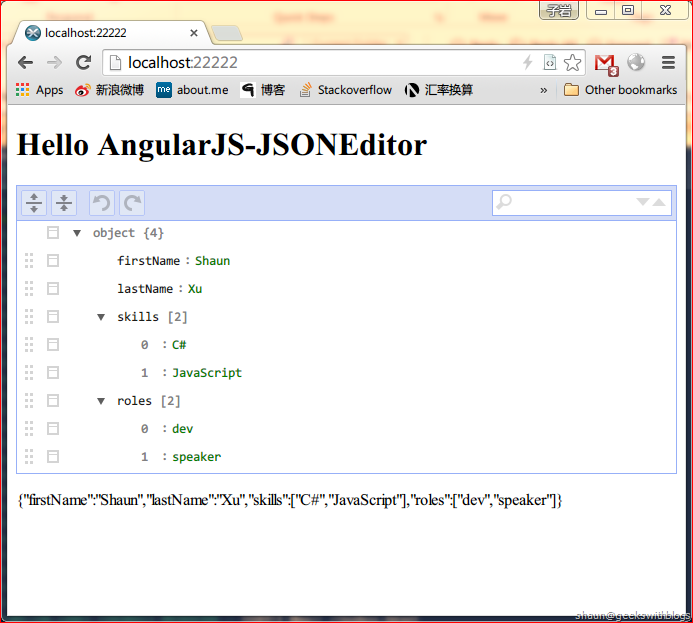 Then I can use JSONEditor in my page. Below is the web page I used for prototype. I attach this directive in a DIV. And I also displayed the scope variant that ensured JSON value was updated accordingly. After launched the web page JSON data will be shown in both JSONEditor and the text area. 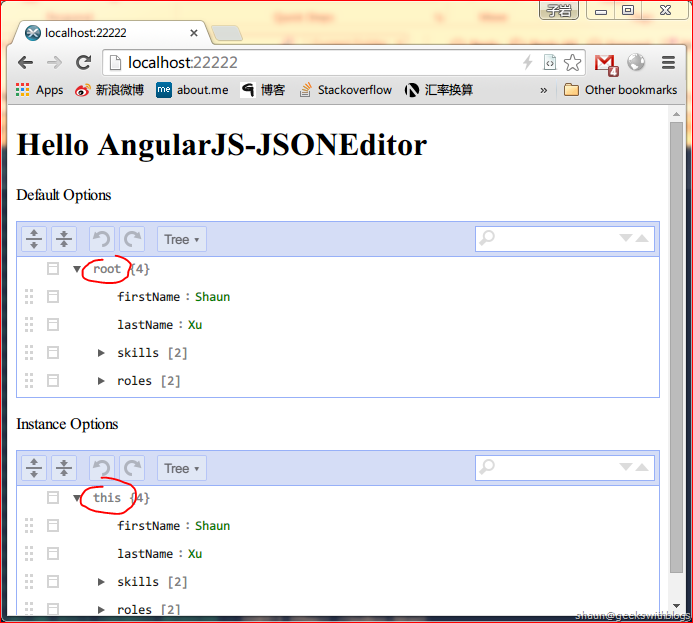 If I changed something in JSONEditor we will find the data was changed automatically. This is good for "My DocumentDB" project, but I was thinking if I can change it as a standalone UI control being used in any my and others' projects. This is not a big deal. 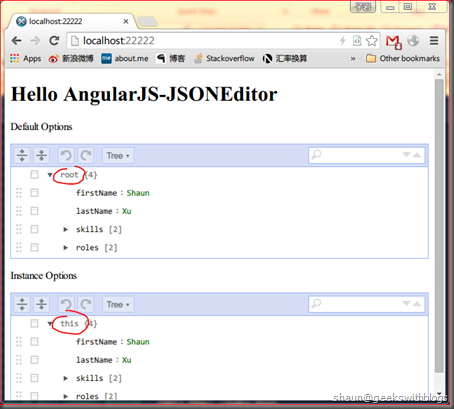 In AngularJS we can use module to group controllers, factories, services and directives. In this case what I need to do is to create a module and put the directive into it, and then changed my main module that depends on it. 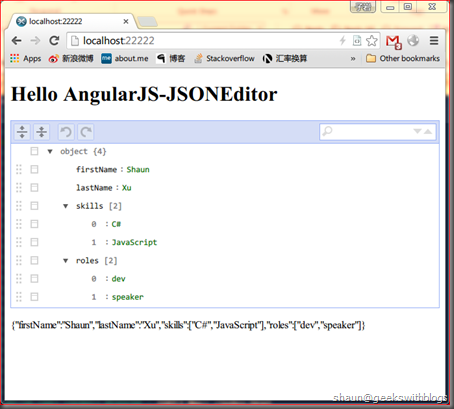 In HTML part I don't need to change anything the page loaded successfully and JSONEditor works well. This is better, but not perfect. I knew JSONEditor allows developer specify some options. This can be done by introducing more scope variants into the directive. In the code below I added "options" variant. So we can tell the directive which scope variant will be used as the JSONEditor configuration. In HTML part I specified which scope variant will be used as the options as below. And in the controller I specified the options, defined the root node text and modes of JSONEditor. Refresh the web page we will see the options was changed. You should use the Provider recipe only when you want to expose an API for application-wide configuration that must be made before the application starts. This is usually interesting only for reusable services whose behavior might need to vary slightly between applications. Provider holds some variants which can be exposed by a special function named "$get". We can defined functions in it which can be used before the application starts, typically in our AngularJS main module's "config" function. In our case we just need to create a provider, define a local variant stores JSONEditor options, expose two function. "$get" function will return this variant, "setOptions" function will set options into this value. And in JSONEditor directive we referenced the provider just created, retrieved the value and merged with the scope variant. Now we have a global options, and developer can specify some options for a particular JSONEditor control as well. Then back to the main module we can define default options of JSONEditor in "app.config" function. After refresh the web page we will see that the JSONEditor options changed even I had removed the options from controller scope. And if I specified the options in the controller scope it will be updated, but the global options still remained. In this post I introduced how to create an AngularJS module wraps a UI control. In AngularJS we should use directive when dealing with DOM. Then I moved the code into a standalone module to make it useable for any other projects. At the end I added the functionality for global configuration. The full sample code is as below. And you can find the module I created in GitHub. I found this job after hard google-ed work, it's very nice. But I use this directive with a service, it doesn't works, it doesn't update in the view.